Facebook’s ascent to become the world’s largest directory of individuals and local businesses is a stunning achievement. With more than a billion users, the scale of its reach is simply staggering. But while the service is still unrivaled as a means of staying connected with friends, its offerings are conspicuously hobbled by a surprising gap: namely, a feed for local-specific content. It should be a no-brainer for Facebook, or an incredible opportunity for enterprising competition. Location-based services to date have focused primarily on user reviews (Yelp, Foursquare), photos (Instagram) and discovering people nearby (Places, Highlight). What we don’t have yet is a widely used service that allows freeform sharing in the style Facebook does—and one tuned specifically to your location. There are many obvious benefits for users: from learning about local news and events, to finding nearby friends, to discovering people like you in your vicinity. There are many ways to do this but I’ll describe one hypothetical approach that mirrors what Facebook already uses for sharing with existing friends—I’ll call it Neighborhood. Imagine a feed that exists alongside your personalized feed (or is interspersed with it). Posts there would be visible to other people in the vicinity, with filters for distance and demographics, making this a way for users to interact with neighbors and share news about what’s going on. Sharing with your neighbors would be easy, as you’d just select an option to copy a post from your friend feed to the Neighborhood. This is an area where Facebook has a unique advantage and where things get really interesting in terms of functionality. Because Facebook knows so much about everyone’s location and preferences, users could define their specific “neighborhood” in a number of dimensions and affinities, such as distance, shared interests, political affiliation, number of likes, and so on. Some users might be very specific in tuning their neighborhood feed, for example, to highlight posts from people with a shared religious or political affiliation, while others may listen broadly to a firehose of data from whomever is nearby. Your neighborhood feed would become an ambient stream about what’s happening near you, as well as a way to passively discover new people, places and events—not to mention services. While social networks for neighborhoods exist, none have really thrived. Nextdoor, for example, has had a hard time recruiting users at scale (4 of 1200 households in my San Francisco neighborhood are online), while Twitter, which has supported location-based tweets for sometime, lacks the type of intelligent filtering Facebook employs to keep noise levels low. In general, location-based services are difficult to build because of the up-front investment needed to acquire and retain users in every location. (I once prototyped something similar to this, but abandoned the project because of this concern.) Clearly none of these issue affect Facebook, as its user base comprises nearly a fifth of the earth’s population, and the company has all of the data needed to ensure that there is activity wherever the service is offered from day one. What’s in it for Facebook? Highly targeted local advertising revenue , and novelty (look out Craigslist!). Ad revenue is a no brainer, but all the more so in this case as it could alleviate Facebook’s notorious difficulties monetizing mobile. More importantly, though, the service would evolve the way we use Facebook, while also altering the way we deal with people in our real-world communities. 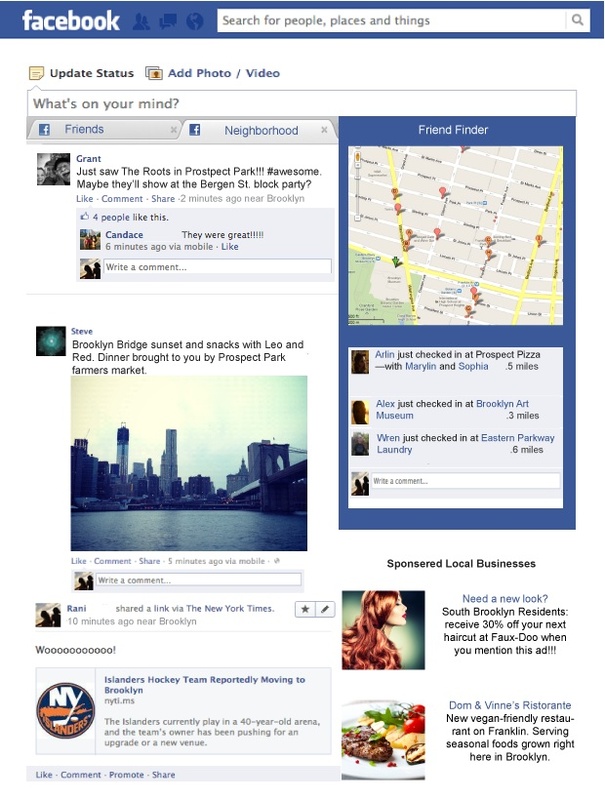 In essence it would transform Facebook into a utility for community-level communication. That’s an environment that’s set up for serendipity, and that often leads to interesting places. Brian McConnell is a startup entrepreneur and publisher of Translation Reports, a buyers guide for translation and localization technology and services. Main image courtesy Sergej Khakimullin/Shutterstock. How about a Facebook professional similar to LinkedIn? Give LinkedIn a run for its money. The issue of scale is significant for any newcomer no matter how good the service. If it isnt one of the big social networks, the other possibility is the wireless carriers who if you think about it have even better data and user scale to make it work. Right on about the opportunity, but it can’t work on Facebook… too many people want nothing to do with it… or have mostly ignored/automated accts. In a small area (like your 1200-household neighborhood), you can’t afford to block out half or more of the people with FB’s walled garden approach… to hard to reach critical mass. In my city, everybody I know uses FrontPorchForum.com… I think they say 2/3rds of households here use it now… super popular and powerful… but not in that “oy, I’ve got to stop looking at this drivel” FB way of being. Much of this resonated with what we are doing at Echoer. The aim is to make it as easy as possible for people to share their local experiences and ultimately interact with the people around them. Most interesting was your comment re Twitter and keeping noise levels low. We get asked about this a lot, and that’s also been one of our main inspirations for making Echoer so visual and having such an intense focus on crowd-sourcing the relevance of information within locations and areas. I’ve tried Echoer and whilst I love the concept, I did not find enough crowd sourced participation to make a meaningful impact on my local venue selections or enable interactions with people around me. Thoughts? Some great points here, Brian. At EveryBlock, I feel we’re actually doing much of what you describe, and that has us really encouraged about our growth prospects. Thinking about Facebook entering the local mix points to the debate over whether to allow anonymous contributions, an increasingly sensitive topic when sharing thoughts and opinions with someone as close as a few doors down. At EveryBlock, we let the user decide how much of their identity they share, and while that for sure comes with its challenges, we strongly feel it ultimately drives better content. I think that if Facebook does something like this, it will actually be a plus for other local services. Facebook is best for freeform sharing (links, pics, comments), but higher value services, like local marketplaces will be best hosted elsewhere. They can solve the problem of bringing _lots_ of people to the party, which will create opportunities for related services. My $0.02. Great concept and it’s amazing they haven’t done this yet.